They come from a diverse social and political background; yet they share a common strand that shows an unmitigated hatred towards Modi which is cleverly couched in a politically acceptable language. Ironically, both are grossly marginalised but have somehow retained the propensity to attract headlines on account of their anti-Modi rant. On the face of it, it may seem difficult to find a co-relation between the two. Let us look at the political journey of Togadia and his career graph. Said to be a good cancer surgeon, Togadia gave up his medical practice to join the Hindutva bandwagon. In the late 80s and early 90s, in the heydays of the Ram Janmabhoomi movement, he was an upcoming hero of Hindutva, besides the two sadhvis – Uma Bharti and Ritambhara, under the tutelage of Vishwa Hindu Parishad (VHP) chief Ashok Singhal. Togadia was then considered a well-educated professional who gave up money and career for the pursuit of the objective of Hindu consolidation. Notwithstanding his fiery oratory that bordered on stoking hatred among Hindus against Muslims, he was still seen as a surgeon who would be guided by the spirit of the Hippocratic Oath. His entry into the Hindutva project was interpreted as association of those who were influenced by higher religious calling to reform and consolidate Hindus. But Togadia was soon attracted to power politics. During the NDA regime under Atal Bihari Vajpayee, he attacked the government and particularly targeted Vajpayee-Advani duo in the most virulent form. In Gujarat, he targeted the then chief minister Narendra Modi and did not hesitate to side with the Congress to hurt the BJP. Much of his enthusiasm for the Hindutva project was diverted to power games to plan toppling the Modi government in Gandhinagar. He miserably failed in his efforts as Modi outmanoeuvred him all over the state. But Togadia was not ready to accept defeat. He pulled strings within the Sangh Parivar and tried to lobby against the BJP leadership, particularly against Vajpayee, Advani and Modi. He found a degree of sympathy among a section of the RSS but that was not enough to effect the leadership change in the political party. Given the RSS’s disinclination to meddle in BJP affairs as desired by Togadia, he ultimately turned against Singhal and other officer-bearers. For the past five years, he literally fell out with the Sangh Parivar and had a running feud with the Parivar’s top echelon. What appears to have alarmed the RSS leadership is the manner in which Togadia orchestrated his disappearance just before a court appearance in Ahmedabad earlier this year, resurfacing later at a hospital to claim that he was tipped off about the central government’s plan to eliminate him in an encounter. Since he was substantially marginalised within the Sangh Parivar, his latest ploy recoiled on him. His position within the saffron fold was further compromised when he forced an election in the VHP – for the first time. He, however, ignominiously failed this month and his rival, Vishnu Sadashiv Kokje, has now become the new international president of VHP. In essence, Togadia’s rise and fall story is guided solely by self-serving impulses that he camouflaged in the rhetoric of Hindutva. 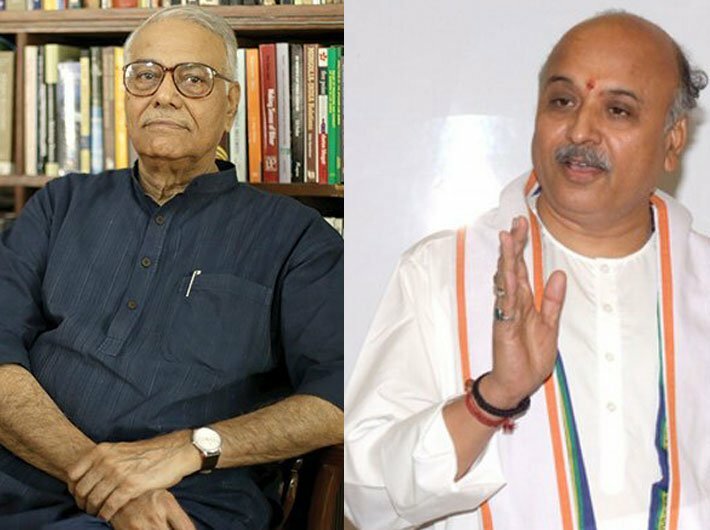 Like Togadia’s, Yashwant Sinha’s story also goes through the same political trajectory. Handpicked by the then prime minister Chandra Shekhar as his finance minister, Sinha, a career bureaucrat, arrived in in the garb of a socialist. His association with Bihar’s redoubtable chief minister Karpoori Thakur came in handy for him to show his socialist credentials at a time when the Ayodhya movement was gaining traction. Chandra Shekhar’s prime ministership came to an abrupt end quite soon, and so did Sinha’s association with it. With the BJP in ascendancy, he found the next mentor in LK Advani, then the most influential leader of the Hindutva movement. As a new convert to Hindutva, Sinha found a cosy company in a section of the RSS leaders espousing the cause of Swadeshi. He was briefly sent to Bihar as leader of opposition in the state assembly. He resigned from the post when his name figured in the so-called Jain hawala diaries – just as Advani did. In the 1998 general elections when the NDA came to power, Sinha was chosen as the finance minister at the instance of the then RSS general secretary KS Sudarshan who virtually camped at Vajpayee’s residence and forced the PM’s hand. With Advani’s backing, Sinha continued in North Block for four long years before he was removed and shifted to the external affairs ministry, against at the instance of Advani. After the NDA lost the 2004 Lok Sabha election, Sinha turned against Advani when the latter visited Pakistan and made a contentious references to Jinnah that extolled him. Sinha came out openly against Advani, with the belief that he would get support from the RSS. A cornered Advani was however more conversant with inside dynamics of the Sangh Parivar than a rank outsider like Sinha who was acting exactly like a career-bureaucrat. Within a few months, Sinha realised his mistake and desperately tried to mend fences with Advani whose own influence was substantially marginalised within the Sangh Parivar. In the run-up to the 2014 elections, Sinha reconciled with his own political marginalisation and emergence of Modi as numero uno in the party. When he saw little chance of a party ticket for himself, he bargained for his son Jayant Sinha’s candidacy from his Hazaribagh constituency, with the hope that his own services would be suitably utilised for some foreign assignments. When his hopes failed, he began his rant against the government, first by attacking finance minister Arun Jaitley on economic matters and now targeting the prime minister too on social and political issues. Interestingly, in his signed article published in the Indian Express, he appealed to BJP MPs, including veterans like Advani and Murli Manohar Joshi, to “speak up” against the Modi-Shah leadership though his own son, Jayant Sinha, is in the council of ministers. Now look at the issues that Togadia and Sinha have been picking up against Modi. Togadia is quite perturbed over the delay in construction of the Ram temple at Ayodhya and the government’s attempt to put Hindutva issues to backburner. Sinha, a saffron torchbearer till last week when he severed his relations with the BJP, was seen loitering in the Kashmir valley and meeting all and sundry in search of a solution to the dispute. In Bihar he is finding democratic and secular virtues in the company of Lalu Yadav-Tejashvi Yadav. Like Togadia, Sinha seems to be impelled by impulses of his personal jealousies and ambitions that may get him headlines temporarily but will be unworthy of finding a resonance among people.